Behind the bookcase half-wall in the foreground is my first dedicated writing space, in the corner of the basement of a little Cape Cod in Goshen, Indiana. 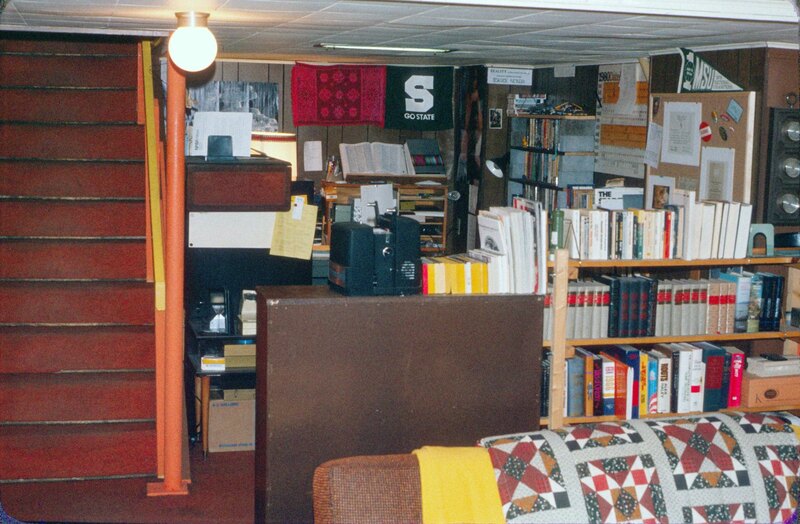 My “office” was tastefully appointed with quality touches like brick-and-board bookcases, a 1979 MSU basketball NCAA championship pennant, a “Reality Is For People Who Can’t Handle Science Fiction” bumper sticker–why, yes, I did do all my own decorating, why do you ask? Ephemera: At the time this was taken, I was still a full-time science teacher at Heritage Middle School in Middlebury, so there’s a school calendar on the side of the black file cabinet, There’s evidence in a couple of places that I already had my NASA NEWS subscription and access to flight press kits. It’s not a con badge on the cork board, since I hadn’t yet attended one. Yes, that’s an Imperial Star Destroyer poster. Ouvre: I’d already written my trunk novel, “The Open Face of Heaven,” in college. But in this space I wrote all of my early stories for AMAZING and ANALOG. “Slac//” was sold and headed for the cover of ASIMOV’S, with art by David Mattingly. I also wrote the sample chapters and outline of EMPRISE here, which had collected three rejections by the time I handed it to a Berkley editor at the 1982 Worldcon in Chicago.